C1696. GEORGE SZELL Cond. 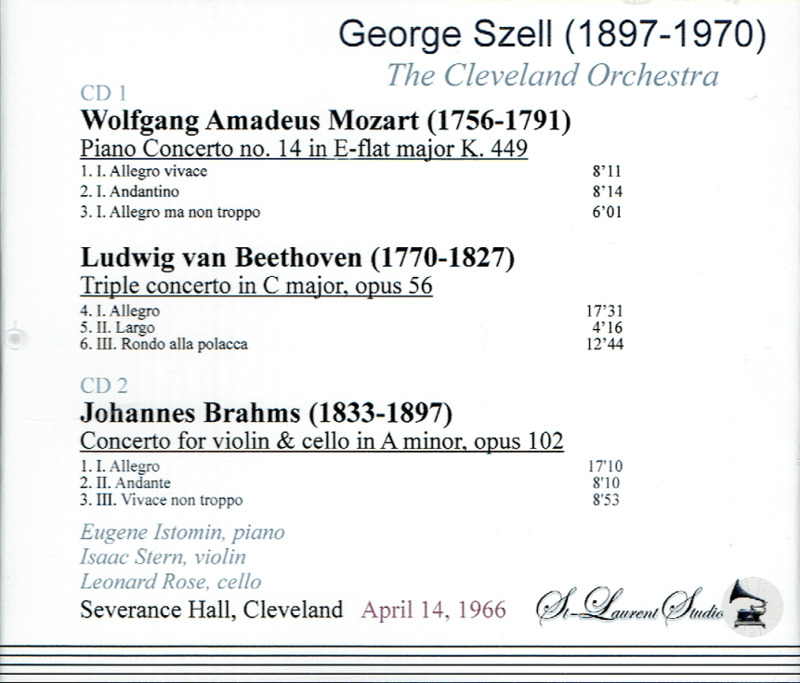 Cleveland Orch., w.Eugene Istomin: Piano Concerto #14 in E-flat, K.449 (Mozart); w.Isaac Stern & Leonard Rose: Double Concerto in a (Brahms); w.Eugene Istomin, Isaac Stern & Leonard Rose: Triple Concerto in C (Beethoven). (Canada) 2-St Laurent Studio YSL T-754, Live Performance, 14 April, 1966, Severance Hall. Transfers by Yves St Laurent. "Eugene Istomin, the American pianist who was as renowned for his chamber music performances as he was for his individualistic, deeply considered solo playing, was best known for his performances of the German and Viennese classical and romantic repertory; and his recordings of Beethoven - the piano sonatas, the violin sonatas with Isaac Stern and the piano trios with Stern and the cellist Leonard Rose - have remained highly prized for their graceful, fluid phrasing. Over the last 15 years, he was more likely to appear in New York as a soloist in Mozart than in Beethoven, and there too he played in an expansive, full-bodied style, often contributing his own cadenzas. "Isaac Stern, a violinist who in his prime was considered one of the great instrumentalists of the 20th century, and who also became an important power broker in the classical music world after he led a successful campaign to save Carnegie Hall from destruction was, in fact, nearly as well-known for his devotion to Carnegie Hall as for his violin playing. He gave more than 200 performances there, the first in 1943. When the Hall was about to be demolished to make way for an office tower in 1960, Mr. Stern helped start a drive among musicians and the musical public that saved the Hall. He was then elected President of the Carnegie Hall Corporation, which runs the hall. ‘Simply for reasons of sentiment and piety, it would be wanton to destroy it’, he said of Carnegie Hall at the time. ‘Think of Tchaikovsky conducting there at the opening, in 1891! Mr. Stern's efforts led to legislation that allowed New York City to buy the hall for $5 million, and when the Carnegie Hall Corporation was established to administer it, Mr. Stern was elected its first president, a position he held until his death..
By 1939 the legendary impresario Sol Hurok was representing Mr. Stern who came to consider Mr. Hurok as a father figure. Within a decade, Mr. Hurok helped Mr. Stern become one of the busiest musicians of his day. In 1949 he played 120 concerts in a seven month tour of the United States, Europe and South America. Still, Mr. Hurok later said he wished he could curb Mr. Stern's desire to be constantly onstage, as well as his penchant for getting involved in causes of various kinds, musical and political. “Leonard Rose was best known for his fresh, full-bodied and expressive interpretations of the standard cello repertory - particularly music of the Romantic era. However, he did not limit himself to 19th-century material and made a fascinating recording of Bach's viola da gamba sonatas with the pianist Glenn Gould in the early 1970's. Mr. Rose also excelled in contemporary material: Bloch's ‘Schelomo’ was one of his specialties, and he commissioned - and later recorded - a cello concerto entitled ‘A Song of Orpheus’ from the composer William Schuman. In addition to his performing career, Mr. Rose was one of the most important cello teachers of his time. He taught at the Juilliard School of Music from 1947 until his death (1984), and at the Curtis Institute from 1952 until 1962. At one point four of the cellists in the Philadelphia Orchestra, five in the New York Philharmonic, six in the Cleveland Orchestra and seven in the Boston Symphony Orchestra had been protégés of Mr. Rose. Erich Leinsdorf used to refer to the Boston cellists as the ‘Rose section’. Other pupils included Lynn Harrell and Yo-Yo Ma. After one season he left New York to become the principal cellist in the Cleveland Orchestra from 1939 to 1943. He then joined the New York Philharmonic Orchestra, where he served as principal cellist from 1943 until 1951, making his concerto debut at Carnegie Hall in 1944. By 1949, Mr. Rose had been the soloist with the Philharmonic 18 times, playing works by Schumann, Dvorák and Lalo, among others. He made his last appearance with the Philharmonic at the 1951 Edinburgh Festival, and then left to pursue a successful solo career. During the 1950s Mr. Rose began to play regularly with Mr. Stern and Mr. Istomin, initially only for personal enjoyment. In 1961, they decided to form a professional chamber-music trio. In the succeeding decade the Rose-Stern- Istomin trio made many recordings and gave concerts throughout the world, touring together for a part of every year. In 1970 - the Beethoven bicentennial year - the trio gave 50 concerts of the composer's music in the United States, Brazil, England, Ireland, Switzerland, France and Israel." 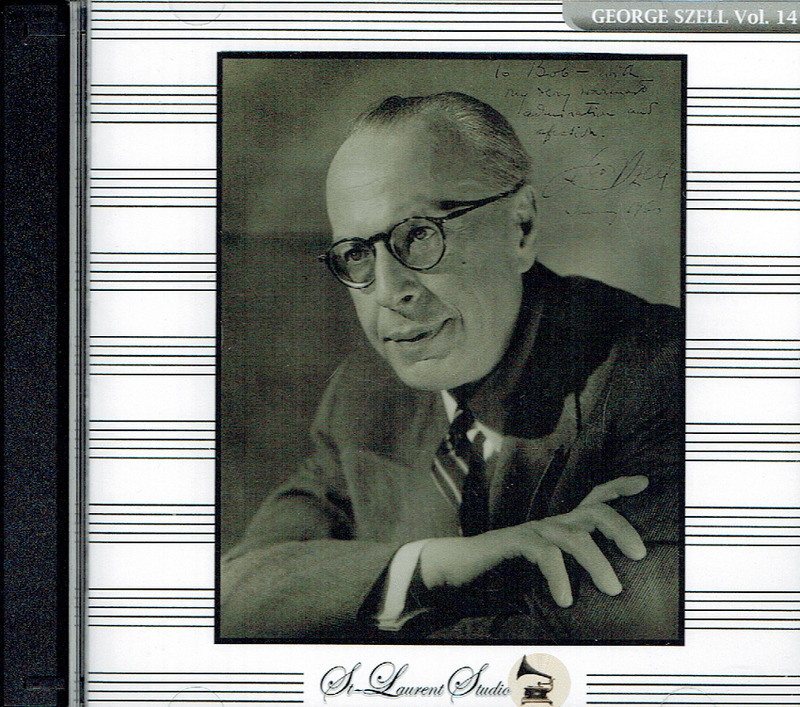 "It must be remembered that when George Szell came to prominence in the United States in the mid 1940s (and his mid-forties) he was a highly respected conductor and musician in Europe. He had a very solid grip on his repertoire which soon expanded to new works which he was debuting and championing. 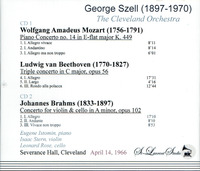 However, all that most music lovers around the world today know about Szell’s artistry they have divined from the recordings made by Columbia in Cleveland from the late 1940s on. In an interview with Szell as an intermission feature in one of the weekly broadcast concerts he stated that Columbia allowed him to record items that he requested only if they were not in conflict with Ormandy or Bernstein. Those he did make revealed meticulously prepared performances which could be misinterpreted as being somewhat objective. The lean balances of those LPs and then CDs only reinforced that impression."